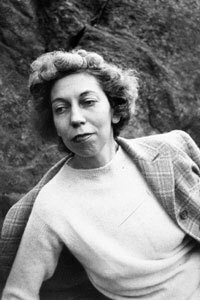 I love the bizarre combination of humor and horror in Eudora Welty’s work. It was there from the start, as evidenced by the excellent “Lily Daw.” Flannery O’Connor mixed comedy and tragedy in the South, too, but Welty’s brand is different somehow. Her humor is less angry than O’Connor’s, her brushes with darkness less dramatic but often no less powerful. In “Lily Daw,” comedy appears to rule the day. The situation is preposterous – a group of well-intentioned women trying to save a mentally challenged woman who would prefer to marry the touring musician she may or may not have slept with the night prior. If that isn’t enough, the language and manner attached to the townswomen is hilarious. But the story guts you. Tucked within all that humor is the detail of the scars around Lily’s neck where her father tried to decapitate her with a butcher’s knife. Just hilarious, right? This story isn’t really funny at all. It’s downright heartbreaking. Yet you’ll be laughing at parts. Sure sign the author has you right where she wants you. And that’s quite a trick on Welty’s part.